I have a problem. A library problem. I keep going back and getting more books to add to my stack. And then not finishing the stack. It's a real problem here folks! I have the best of intentions and want to read these books. But I get swayed by book club books, books with my kid, books for review, and you know the internet and chores and stuff. I won't lie, I don't hate the problem. And it's probably way better than my Reeses Peanut Butter Cup problem. I was going through some library withdrawal since the last two books I read were 1) a review copy and 2) a kindle read so I stopped today when I was done working out and it was open. I mean I stopped for my kid and got distracted a bit. She is loving anything Little House related. She's a few chapters in Little House on Boston Bay by Melissa Wiley so I got book number 2 since it was checked in. 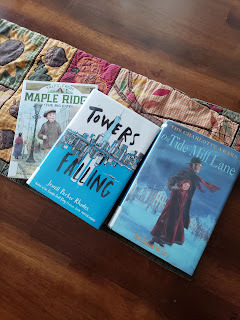 She got started on the Maple Ridge series earlier this month when I asked the librarian for a suggestion because she has read almost all the books our library has about Little House related characters and I figured she needed a new series. Logan Price is a young boy in the 1800s and she flies through these books as well. 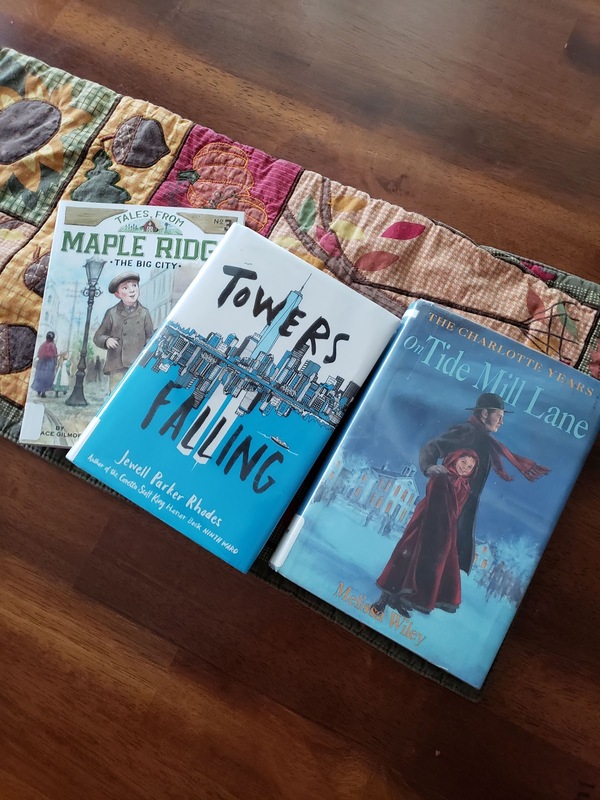 Towers Falling by Jewell Parker Rhodes was for myself. She is the author of Ghost (which I LOVED and will not stop recommending) and the Louisiana Girl Trilogy that I read through this summer (Sugar, Ninth Ward, and Bayou Magic). I'm about to start The Miscalculation of Lightning Girl by Stacy McAnulty, which I already had at home from the library. Do you suffer from a library addiction? Any book recommendations for my Little House lover?